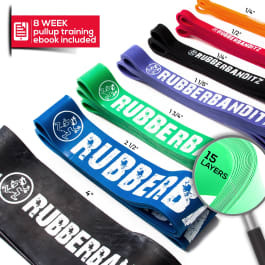 Hello everybody, I’m Joel, and today I will be your helpful guide to stretching for yoga using exercise resistance bands. 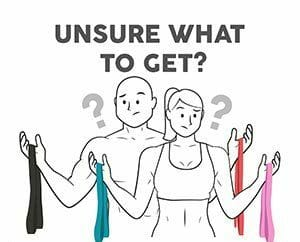 Part of being a guide is pointing out some things to look for as we start off this journey of using resistance bands for yoga.Therefore, after you finish reading this blog and possibly even try the resistance band exercises out on your own, you will feel a little more confident exploring further information and band exerciseswith all of the new knowledge you have. Now, let’s dive into everything you need to know about using resistance bands for yoga successfully! 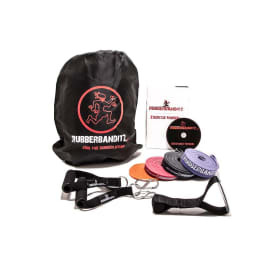 I will start off by discussing information regarding resistance bands for stretching and transition to yoga. Stretching: How does it ACTUALLY work? Stretching, interestingly enough, is based on stretch tolerance-- not necessarily a lengthening of a muscle. People often think because it feels like a muscle is being lengthened, the muscle is getting longer; however, thisis not the case! Muscles do not permanently lengthen from stretching, but instead, move intoa more temporary range without signaling any pain -- enabled by the nervous system. Therefore, stretch tolerance is the fundamental unit of stretching, as it is what allows us to move into ranges of motion without feeling any pain. The question then is, how do I improve my stretch tolerance? This answer to this question can be a little tricky and confusing, as it is determined by the mind and nervous system much more than by the muscles. The nervous system’s main job is to keep the body safe and alive, so it responds whenever there is a reason to feel like it isn’t safe or life is being threatened. The especially tricky part of this response is that the nervous system errs very strongly towards being safe and there are many times it will restrict movement when there is nothing particularly unsafe about what is being done; this is simply because the brain perceives it as unsafe. For this main reason, we cannot all do the splits. We haven’t been in that range of motion very often, if at all, and the brain, not knowing that doing the splits is a safe thing to do, deems it as unsafe. So, how do you change the brain’s perception of whether or not something is safe when you are stretching? Wow, good question hypothetical audience. You can change your perception by spending time in positions that aresimilar to the one you want and still comfortable enough. You do not want a full on pain face, but you do need to move into ranges that are slightly uncomfortable. In terms of doing to the splits, spend time sliding into comfortable-enough ranges, such as doing a long lunge, or using a slider. Generally speaking, anything more than a seven out of ten on a pain scale -- where a “ten” is going to the hospital with a broken bone -- should be avoided, as should sharp or stabbing pains. Otherwise, roam freely and know that your perception matters! Enjoying the stretching you do is important. Stretching For Yoga: Where now? Before we get started discussing stretching with excercise bands for yoga, know that yoga is a complicated mental, physical, and spiritual practice that is not anywhere near simplyfocusing on “getting your next pose.” This should be considered when aiming to alter the practice of yoga, as there are benefits that could be lost in focusing on an approach like this. It is also important to recognize that yoga takes many forms and each needs a slightly different approach. Having trained in Ashtanga and Vinyasa myself, I will focus on what I know, but aim to give you general takeaways so that some of you Hatha, Iyengar, Yin-Yang, Japanese (and the list goes on) yogis don’t miss out either. With that disclaimer out of the way, let’s get to it.First and foremost, yoga as a physical practice needs great hamstring, adductor, hip, spinal, and shoulder mobility. This may present a great challenge for a lot of us that spend the majority of our day in very limited positions such as standing and sitting. These limited positions have become an issue, as others, especially early on, are ones that the nervous system did not often see or spend time in. The result: a nervous system that is far from comfortable in these positions, low stretch tolerance, and a low capacity for load in these positions. It helps to remember that your body’s capability is a combination of the movements you do every day. If sitting and standing and walking is all you do every day, that is pretty close to the sum of what you are capable and comfortable doing. While we already know we should spend time in positions we want to improve it, we still don’t know how much time we should spend there, how often we should do this, and what we can do to remedy all the not doing these things our work lives tend to present us with. Let’s knock these out quickly. Stretch tolerance is best trained with a medium frequency (2-4 times a week), and assuming you have some yoga practice, it is likely best to be on the lower end of this range as your practice adds to the frequency. Volume is not as necessary as positive associations and high-quality practice (meaning days where you aren’t finding as much range shouldn’t necessarily be pushed but treated more playfully and lightly). This means spending no more than 5 minutes training a position you want to improve upon, generally, with intensity being medium to high. As long as regular, relaxed breathing can occur, no tightening or grimacing occurs, and no sharp (or 7+/10) pains are felt, intensity can be relatively high. Just remember -- you will still have to recover from this, and the more volume, intensity, and frequency you use, the harder it will be to recover properly for your next session, where you will need high-quality practice again. As for remedying work life -- remedying is a bad word! Try to sit in a variety of positions or change your standing stance, consider 5 min breaks where you can move in a variety of ways that aren’t what you have been doing when you sit or stand. Stretches that will hit your hips, adductors, spine, hamstrings, and shoulders and help you with your yoga game are below. Use the above guidelines with what feels right for you to get the most of them. I will include recommended amounts assuming you are already doing yoga practice twice or three times a week. Be sure to alter as necessary and see a professional to ensure your body can deal with the positions and loads we are placing on them first. Now let’s look at why I chose these exercises specifically. We want to improve yoga postures, but what do yoga postures most often require? Going off the yoga I have done, Ashtanga, Vinyasa, and Yin/Yang all require good levels of pelvic tilt and hamstring/low back flexibility for forward folds. To address the pelvic tilt, we have wall roll downs which focus on spinal segmentation, compression, and hamstring flexibility by practicing a vertebra by vertebra roll of the spine, limited by the wall either ahead or behind us. The 90/90 spinal waves and down dog exercises also reiterate these sentiments in different ways: the up-down dog by contrasting extremes to give you a mental map of how to better stretch your hamstrings and low back as well as tilt your pelvis relative to a point of opposition -- the up dog. The 90/90 spinal wave aims to ensure that low spinal rotation and pelvic tilt do not limit the development of these qualities either. The straddle sit addresses the open-leg elements of these forward folds. The squat to stand has been placed in the workout to ensure we are able to fully flex and extend out hips, ankles, and knees. This is extremely useful in seated poses with bent legs, as it drills the active compression and hip flexion needed to bring the knee in close to the chest. It is also doubly useful in refining chair pose, for example. Another key element in yoga is spinal mobility and range of motion. Yoga demands a spine that flexes, extends, and rotates. To ensure this occurs, we have cross-body scorpion kicks, rotational bridge reaches, and those mentioned above. I even added in a 90/90 pails and rails to ensure that you have the ability to create and resist force (read: “active mobility”) when twisting in yoga, which is central for stability of your core muscles and injury management. Finally, yoga exercise needs a set of shoulders that are pliable as young bamboo. We do up/down dogs, banded floor angels, rotational bridge reaches, and banded down dogs to ensure our shoulders flex, extend, and rotate in safe and stable ways while also creating flexibility and strength for various muscle groups. You best BELIEVE this will make you a yogi worth remembering.